Williams Heating & Air Inc is proud to serve the Ava community! About Ava, IL - Happy to be your hometown Heating & Air Conditioning Contractor! 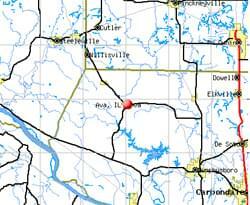 Ava is a small city located in Jackson County, Illinois, and according to the most recent census the population was 662. Ava is made up of 1.07 square miles of total area, of which 0.01 square miles consists of water. Famous MLB baseball players Charlie High and Andy High are both from Ava. This community is known for its four seasons of which spring is the wettest. Summers are typically hot and humid, and winters see snow and cold temperatures. Ava is a very small town, so there are few attractions available in this area. However, there are numerous outdoor recreational opportunities available. Some of these include Sharp Rock Falls Rec and Campground, the Johnson Creek Recreation Area, Bower Park, and Clyde Cheatham Memorial Park. The Shawnee Country Store is another popular destination.